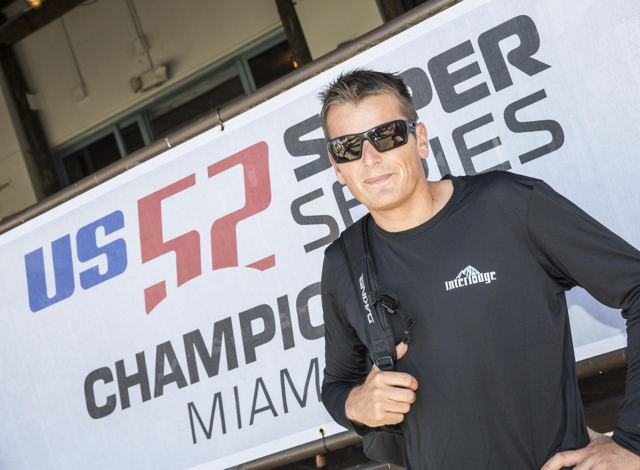 New Zealand’s two times MedCup championship winning skipper-helm Dean Barker is flying in to Miami to join the 52 Super Series for the first time. Barker, who steered Emirates Team New Zealand to TP52 circuit overall wins in 2009 and 2010, is reported to be relishing the opportunity to deputise at this 2014 52 US Super Series second event for Interlodge’s owner-helm Austin Fragomen who sustained a skiing injury two days ago. The boat which was runner up in Key West in 2013 finished with a flourish there last month, narrowly missing out on a podium finish at Quantum Key West in January. Barker’s imminent arrival and the recruitment of Kenny Read as tactician on Hooligan, the winning potential of Vesper which is well optimised, were the hot topics on the dock at 52 Super Series’ Miami Beach Marina as the 52 teams put in their final preparations and training before Tuesday’s practice race. America’s Cup winner Ed Baird resumes helming duties on Quantum Racing and Azzurra’s ebullient tactician Vasco Vascotto has just underlined his form by winning the Melges 32 Miami regatta on the same waters this past week. “There is good step up in the fleet with Vesper here and with Kenny Read on Hooligan and Dean coming in and sailing on Interlodge, I suspect it will be different. In Key West we had Doug (DeVos) steering the boat and that was awesome for us all, but he had not been on the boat for 11 months and there were challenges there, and so I am still scratching my head a little how we did it. The official practice race starts at 1300hrs local time (UTC MS 5 hrs) with the points scoring racing scheduled Wednesday to Sunday. “We thought that the boat was not as fast as it should have been in Key West and so we have made some changes, nothing radical, some easy things with the sails and rig, but we made some mistakes in the afterguard, some wrong choices which cost us many points. "It is good that Vasco and I have sailed here with the Melges for four or five days with the Melges 32s and so we have, I think, a good idea about the race course. It was mainly light winds, up to 13 knots. I think there will be a little more wind middle to end of the week. We will start the championship in light to medium airs. The baot can go well, we can sail well. We have no reason not to go out and get good results. “We have a new tactician with Kenny Read and Tony Rey on strategy, so we have had a little more time to prepare the boat and practice. Really at Key West the boat had just arrived and so hopefully now the little changes we have made will pay off and we will get a little bit better result. "For the owner it is still just his second regatta with the boat and with the tiller, and so it is still not easy to make good tack, by comparison with the rest of the fleet, in these wide boats. We are getting better. The rest of the fleet have everything perfect and so you just have to keep working away at tactics, boat handling, boat speed. “There is good step up in the fleet with Vesper here and with Kenny Read on Hooligan here and Dean coming in and sailing on Interlodge, I suspect it will be different. In Key West we had Doug steering the boat and that was awesome for us all, but he had not steered the boat for 11 months and there were challenges there, and so I am still scratching my head a little how we did it, did we do it with smoke and mirrors but in some ways Key West was just a great representation of our team. It was great Ed slide into his role as strategist and Doug in his role and still achieved a great result. Here we are back into our Mediterranean set up. We have some great teams here to race against and that will be great challenge. It is a new evolution because of course we have lost Jordi calafat as strategist, for the year because of the weight change. I am nervous about the challenge ahead because the other teams are really, really good. “Austin had a skiing accident and has a couple of bruised bones. It was really cool because there was never any talk of not doing the regatta. He wants to support the class and all the guys had put in all the work and so he said ‘let’s see how good the boat is, let’s get someone good. The boat captain Kris started calling around and Dean was really keen and said he could be on a flight and be here in the morning and so that is cool. It is great for all of us who have sailed the boat, and it will be good to see how good the boat really is and what the next step. Dean is a good guy and pretty nice with it. We will just have the practice race with him and then be into it, but he has done this a couple of times before and he is not too bad at it. “We are in good shape. After Key West we were pretty happy. We have Jared Henderson here helping us out as coach. If we can improve our percentage here, getting across the starting line, up to a respectable level we can be in the mix. That is what we are looking for. That is down to consistency in our manoeuvres and communication from the bow all the way to back of the boat, so we are making it really simple for those who have to make the decisions.